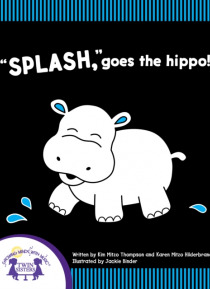 IHG® Rewards Club - eBooks - &quote;Splash,&quote; Goes The Hippo! Help baby learn the special sounds and actions of different zoo animals with this adorably-illustrated book. Black and white art and bursts of color will capture baby's attention with large,simple pictures that encourage learning. Includes: "e;Splash"e; goes the hippo! "e;Roar"e; says the lion! "e;Swing goes the monkey. "e;Hop"e; goes the kangaroo! "e;Grr"e; say… s the bear! "e;Munch"e; goes the giraffe! "e;Caw"e; says the toucan. And "e;Stomp goes the elephant!